Everyone loves Christmas. I think Florence is magical during this time of the year. Maybe because of the thousands of lights along the streets, maybe because of the nice Christmas decorations in the shops – or maybe because I got married in December :-). I love Florence at Christmas time. Starting from Piazzale Michelangelo, you can admire a breathtaking view of Florence that looks like a postcard. When it’s dark, everything lights up and you can see the Christmas trees and decorations in homes through the windows. Coming down into the city and crossing the Arno, you can feel that Christmas is all around. This year the municipality of Florence lit up all the avenues with thousands of blue Christmas lights which warm the atmosphere from Piazza Beccaria to Fortezza da Basso. Most of the streets in the city center are also decorated and illuminated for Christmas. 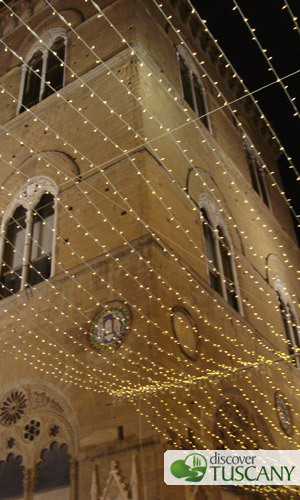 Via dei Calaziuoli is fabulously decorated with thousands of lights set as a rich drapery – it looks like the Red Carpet! 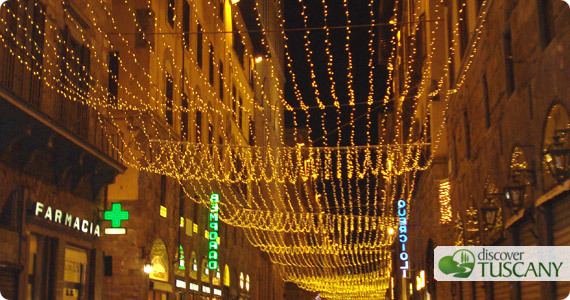 Even smaller streets such as via della Condotta and others are illuminated by colorful lights shaped as snowflakes or falling snow. Then in Piazza della Repubblica stands a grand Christmas tree near to the characteristic merry-go-round for children. The shops and their windows are also embellished by Christmas decorations as well as Christmas trees decorated with various trimmings and colorful lights. Florence is just missing Santa’s bells to be perfect. Florence also offers a vast collection of Christ’s nativity scenes such as the one at San Marco Church whose infant Jesus is a rare Renaissance sculpture. The big nativity scenes at the Church of Santa Margherita and at Santa Maria de’ Ricci Church deserve a visit. I also recommend a visit to the charming nativity at the Certosa of Florence near Galluzzo made by the monks – and don’t forget to buy some honey sweetened candies made in the monastery. During Christmas time many different events take place in Florence. For example, the new Library of Oblate has an amazing view over Brunelleschi’s Cupola and this month is open from Monday to Saturday up to midnight. It’s wonderful to drink a hot cappuccino at night while looking up at the duomo. You can also look at the sky above Florence by night at the Florence Planetarium. Then on December 20th, Palazzo Vecchio opens for its citizens all day long up to midnight. During weekends, you can enjoy many classical music concerts around the city, workshops and special activities for children in museums and Christmas markets in Florence and its surroundings such as the German Christmas market in Piazza Santa Croce. Since I love Florence so much on Christmas I organized a romantic walk for me and my husband. We started our tour in Piazza Santa Croce visiting the German Christmas market where we ate a big “bratwurst” (German hot-dog) with mustard and sauerkraut, a delicious crepe with Nutella and a candied fruit – you know that every diet goes to pot on Christmas ;). Then we wandered around the streets in the city center – burning off the dinner – admiring its Christmas decorations. We stopped in Piazza della Signoria, Piazza della Repubblica and Piazza Duomo taking some pictures. I really appreciated Piazza della Repubblica and Via dei Calzaiuoli where you feel that Christmas is coming. At the end we stopped to drink a hot cappuccino at the Oblate Cafè located on the roof of the library. From there we enjoyed the spectacular view of the Duomo and its cupola. So what better way to end this post than to wish you a Merry Christmas by all of us at the Discover Tuscany Team! Happy Holidays!